Available in 2 lb. and 5 lb. bags. Our 2, 5 and 55 lb. 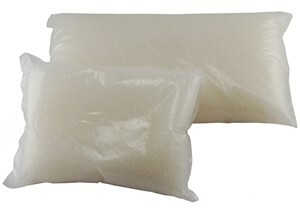 bags are the most economical way to purchase loose silica gel. If you're looking to find an economical way to dry something out, silica gel's drying capabilities are up to the task. Many of our customers are using this to dry flowers or electronics that have become water damaged. Q. What size are the silica gel beads? A. The silica gel beads vary between 2.0 and 4.0 mm in size. Q. Can my bulk beads be re-used? A. Yes, they can be placed in an oven at 240 degrees for at least 3 hours to dry them out, then put back to use again. Q. How will I know when they are no longer active? A. We suggest purchasing the indicator silica gel (a small quantity is all that's needed) and mix it in with the non-indicating silica gel.